Photo of Seal Swim neckband. WE ARE TEACHING our youngest how to swim and that could mean she will be in the water by herself. I'm considering some simple technology that might alert us when she needs help in the water. 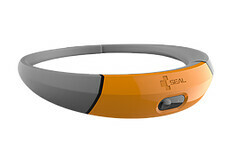 The €114 Seal Swim Monitor is a band that could hang around our five year old's neck and connect wirelessly with the guard band worn by myself or a lifeguard. When the neck band is submerged for a certain period of time, it sounds an alarm on the guardian's band and on its own charging station. Several bands can be used at once and settings can be adjusted to take into account the swimmer's proficiency. It communicates wirelessly over a range of 80 metres but I don't know if it's been tested to more than 10 metres in depth. I know Mia would like a pink neckband. Customisable front cover plates help differentiate units specific to certain swimmers or allow a team to look like one. Bernie Goldbach used to finish mile-long swims every week as a teen. Screenshot of Pinboard Popular snapped from my Nokia Lumia 925. FRIENDS WITH WINDOWS PHONES often ask how to take a screenshot with their handsets. I tell them to touch the the Start icon and the power button at the same time. If they're co-ordinated, they'll hear the sound of the shot being snapped. If they're not, the Windows Phone spoken search will start running. The power button is metal on the side of the phone. the Start icon is the Windows flag on the middle button of the phone's screen. Screenshot appear in the Screenshots folder in the Photos hub on the handset. I've discovered they're handy ways of capturing the moment--like information on screen during a fast-flowing conversation on Twitter. Or a comment below a blog post. Or a stream of information inside a discussion in a LinkedIn group. I've used screenshots as key items in Slideshare presentations that feature in my creative multimedia lectures such as shots from favourite watering holes like Pinboard in the screenshot. With a little practise, I'll improve my screenshots of streaming videos. You can learn a lot by analysing key frames. Bernie Goldbach with tactile gear in Tipperary. A CRUSH OF several priorities is pushing me back into the realm of truly analogue work, starting with the gear in the photo. 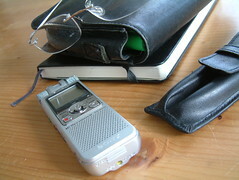 Although the Sony digital dictaphone looks non-analogue, it fits the brief because I'm spending the next two weeks rewinding stories around drawn and snapped work. It means face-to-face with relatives in a remote location. I won't be using my laptop during this two week interval and that means my blog publishing will become even more sporadic. I've a work-around for that and might use it since the process I've in mind uses an email client and no web browser. Back in 2002, I took the same amount of time off and away from a laptop keyboard but back then I had a Nokia Communicator keyboard that kept me in touch. That occasional touchpoint cost me more than EUR 400 on our return to Ireland because of the extortionate data charges due to roaming. I don't feel compelled to sniff around the internet this time, mainly because in my mind I hear the voices of authors I trust telling me they get to their set points by focusing directly on what they have to write. No Twitter. No email. No Facebook. No browsing. I'm off to try the same approach and that means no casual social networking unless I've hit my daily word count of four Moleskine pages. Bernie Goldbach in LSAD-Clonmel | Screenshot from my Flickr. I HAVE ATTENDED events for Irish educators since 2004 and believe the social media back channel supporting those educators peaked two years ago. At three different conferences held during the past eight weeks, no more than 20% of the entire aggregated attendance shared thoughts on social networks, blogs or rich media streams. I harvested the hashtagged content representing more than 300 participants and the result yields less conversation than I used to see at similar events in 2010 and 2011. I learn a lot from the cross-talk during and after conferences that span several days. When the electronic conversation falls flat, the whole event can lose its soul. Analysts who track the increase of followers know one of the prime determinants of Twitter followers is the size of a conference audience listening to a keynote address. If I present in front of 400 people, I routinely get an additional 40 followers--many who listen or watch remotely. That does not happen at academic conferences because the audience demographic listens to other channels outside of those commonly embraced by most of the public. Sent mail2blog using TypePad O2 services in County Tipperary. How can social media help us achieve academic success? Bernie Goldbach in #elss13 with Nadine Lattimore. 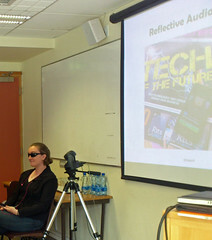 MY FIRST demonstration with voiceover happened today during an unplanned event at DIT's e-learning summer school. It was memorable. I enjoy attending events planned by Kevin O'Rourke's team in the Dublin Institute of Technology because something spontaneous emerges every year. What happened today took spontaneity to a new high. I was planning to show voiceover to a room full of third level educators but a singing gig popped up a few days ago and it threatened to pull Kerrie Doyle (ker1608 on Audioboo) away for a practise session in Whelan's. But a half hour from my start time, several staffers in DIT told me there was a visually impaired woman in the hallway with her dog. I glanced up at the half-open door and saw Kerrie dressed in her distinctive black sunglasses along with Cyril, her faithful Black Lab. I jumped up, hurried to the door and said how surprised I was to see her at the session. She was surprised to hear me too because it wasn't Kerrie. Instead, Nadine Lattimore and her Black Lab Quartz had come to hear what sorts of accessibility measures were being discussed during the e-learning week. Apologising for mistaking one visually impaired woman from Dublin for another, I asked Nadine if she wouldn't mind showing the group their first session with voiceover. What a champ! She agreed to do it! So Nadine downloaded and installed Audioboo for the first time. Then she made a short Boo and shared it to the group, marking an historic moment for me--not only because she figured out how to create social audio on her own but because she also shared the fundamentals of Voiceover with an attentive audience of third level lecturers. Because of Nadine Lattimore's capable contributions, I'll never forget my first voiceover session. 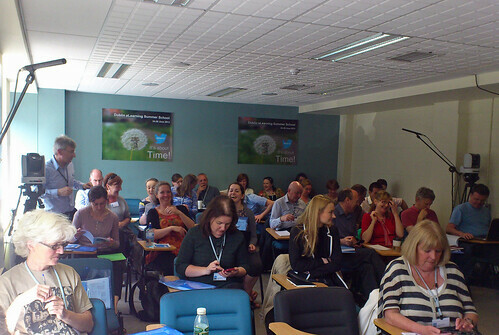 I ENJOYED PRESENTING ideas on reflective audio journaling to a room full of Irish educators during the 2013 running of the e-learning summer school at the Dublin Institute of Technology (DIT). 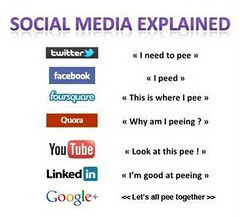 My Slideshare is below the break. Bernie Goldbach in Limerick with his Moleskine. ON THE ONE HAND, I work with academics who deduct marks from papers citing Wikipedia references. On the other hand, I hear other academics who want Wikipedia references to their work. I wonder if both camps are wrong. Should proper respect go only to those references printed on paper? That sort of standard would change my perspective on self-publishing but only on one level. I still think there is room for epubs but I want the respect of a traditional source. Plus, there is the matter of front page coverage. Nothing turns heads or gets framed faster than a front page shot. I finished a morning of briefings in which people talked about where they see stuff they respect. 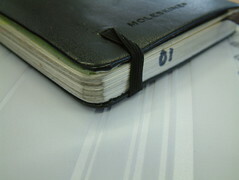 I've got a Moleskine page set aside with things to do in the space of high brow print. Now it's back to the Skunk Works to give it a sanity check. Sent mail2blog using Xperia O2 TypePad service. Bernie Goldbach found a pertinent discussion on Reddit. TOO MANY OF MY friends have gotten really bad at privacy. "You know what happened on 9/11" they tell me with bated breath. They're accepting a massive deterioration in liberty because they cannot fathom what might happen. They're hopelessly uninformed because they've never worked with contaminated data sets. And they're unaffected by oversharing that so easily becomes a part of their socially networked lives. Two generations from now, historians will marvel at how the first cohort of truly connected citizens stumbled through levels of protection that people need in order to keep their affairs to themselves. This isn't a matter of secrecy--it's all about privacy. Cory Doctorow explains, "Privacy isn't secrecy. I know what you do in the toilet, but that doesn't mean you don't want to close the door when you go in the stall." 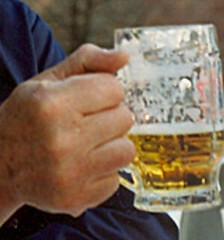 My dad's hand clapsing a friendly Bitburger. AS FATHER'S DAY approaches in Ireland, I think about my dad's hands and how I can't clasp them anymore. Dad was an honest man--more honest than me. He was a devoted man, a charitable soul. When I walk into community gatherings near my family home in Lancaster County (Pennsylvania), I watch people sit up and wonder because I bear a striking physical resemblance to my dad. But all they have to do is look at my hands and realise I'm not the real deal. There's nobody like my dad and nobody I'd rather wish "Happy Father's Day" than him. Now that he's gone and another Father's Day rolls around, I'll celebrate his memory by having a pint, eating shrimp, munching on olives and shelling peanuts. It's important to keep family traditions alive by doing things dad once showed me with his hands. Bernie Goldbach is a blow-in American living in Ireland. Sandy Pugh -- "My Father's Hands" on The Rural Messenger, June 10, 2012. Bernie Goldbach was in the jump seat of Golden Bear over Golden Gate in the Summer of 79. OVER ON AUDIOBOO, one of the most congenial social networks on the planet, several people are discussing noise overhead, in the street, in their gardens and in their earbuds. To each, their own. 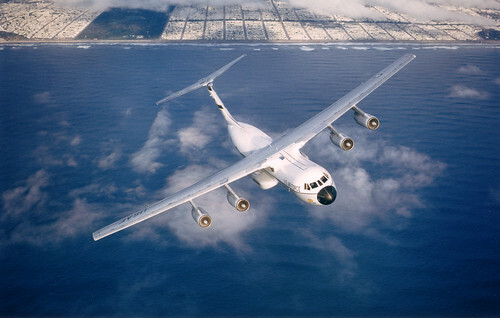 I used to live less than a mile from several runways, so not only do I know the roar of a turbofan and the blast of an afterburner, but I also remember the taste of JP4 exhaust wafting over my morning coffee. All those things came crashing home to me as beautiful noise in an Audioboo. Bernie Goldbach teaches social audio as an element of creative multimedia in the Limerick School of Art & Design.